This week Jase and Simon head out from the Eyre Telegraph Station. This southern bush is a lot sturdier than its northern counterparts, so the boys abandon the trailers to get moving faster. They finally get to the site commemorating John Baxter, the explorer companion of Edward John Eyre. 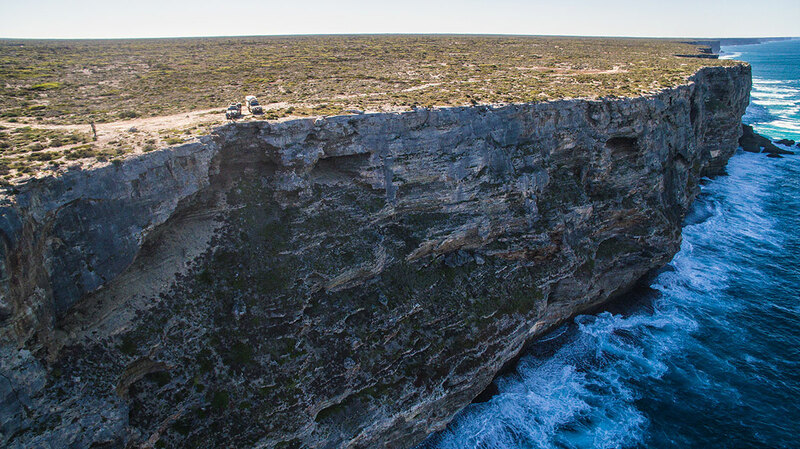 From the Baxter Memorial, they take a minute to check out the spectacular view of the 200-kilometer wide Baxter Cliffs. But Jase knows of a place where there’s a break in the cliffs, and the only spot to get down to the water is at Toolinna Cove. The tough terrain takes its toll on the spirits of Captain Happy, so they stop to set up camp at a place called Wylie Scarp. And Jase has a new unique way to light a fire with glycerol and potassium permanganate. The next morning they make their way down to the beach, and Simon has a bit of a mishap which requires them to pull out the recovery gear. They find a place to park the trucks and then get the buggies off to explore the Bilbunya Dunes, the largest sand dunes in the southern hemisphere. The next day they move along the beach to the Israelite Bay ruins. At camp that night, Jase gets Simon in on the cooking action with an old-fashioned scout recipe called Squiggly Damper. The next morning, they’re off to find a shipwreck down on the beach thanks to a tip from the locals. But that soft sand and those heavy trailers mean there’s some winching ahead! Do you have connection to these places we’ve visited? Share your stories and photos on Facebook!